Website: Yeah, but it’s way out of date. Check their Facebook for quasi-accurate information. In this day and age of technological hocus pocus, it’s rare to see a food truck vendor that isn’t actively on the varying social media platforms, unless they’re one of the old guard chip wagons. So when I saw taco slinger Yakko Takko parked on Bank Street in the Glebe and I couldn’t turn up much info on it, I had to get the 411 the old fashioned way: by eating there. 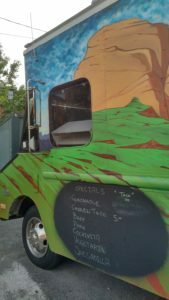 On my first visit last year, the truck was set up beside Kunstadt on Bank, and my wife and I were on our way to a movie at Lansdowne, so we stopped by for some tacos to fuel our movie-going experience. Painted as a lovely landscape mural with tall mesas and beaches, the truck was eye-catching without being garish. Two bull dog-ish mixes were lying lazily on the asphalt by the truck; well, one was lazy (truck namesake Yakko), while the puppy begged me to play with it until I finally did, and continued to do so until I left with my food in hand. Tacos and fun dogs? Hell yeah. 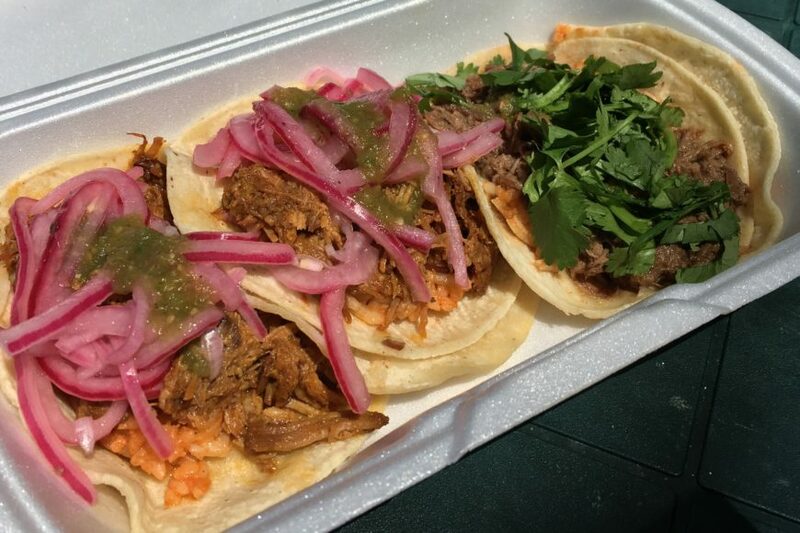 The menu is pretty lean – they’ve got tacos, quesadillas and burritos, and you can have your tacos as chicken, pork (pastor or cochinita), beef barbacoa or vegetarian. I wanted to sample a spread, and I assumed they were on the small side at $5 a pop, so we ordered a chicken, two pastor, two cochinita, plus a bottle of water. When prompted for how hot we wanted them on a scale of 1-10, we shot for the middle with a five – in theory balancing out my spicy preferences with my wife’s relative lack thereof. There was a bit of a wait as the owner seemed to be left to his own devices by the other guy who had been in the back, but I wiled away the time by playing fetch with the dogs. The cooking food really got our appetites going as the smell of corn tortillas and pork wafted out of the window. When we were handed our food, we had actually been given two of each of the kinds of tacos that we wanted, although we got the water au gratis, so the friendly gesture balanced out the slightly botched order. Walking and taco-ing on the way to Lansdowne, we started off with the chicken tacos. Double wrapped in small corn tortillas, the chunks of chicken breast were on top of a bed of seasoned rice, and had a sprinkle of onion and cilantro, as well as a healthy dose of salsa verde. Healthy, yes, but also very, very spicy. I could tolerate it – just barely – but it was one of the spiciest things my wife had ever had. And this was a 5/10 on their spice scale, so buyer beware. I appreciate that they aren’t pulling punches, but I’ll personally have less spice next time so that I can enjoy the other flavours more. 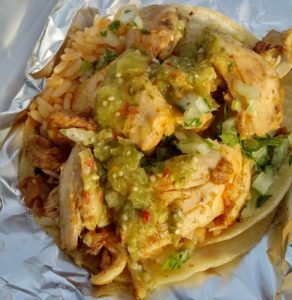 The chicken was tender and juicy, and the rest of the taco had a fresh and light flavor profile, but man, that spice. Oh, and I can’t forget the corn tortillas. Hot off the grill and doubled-up for structural support for the infamously frail wrap, they were the best I’ve had in Ottawa and probably in Canada. I plowed onward, hoping that the pork tacos wouldn’t be as spicy and would thereby blunt the blow of the chicken. 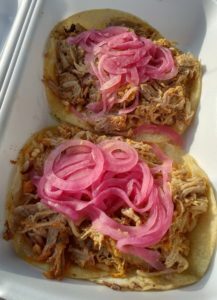 The cochinita was a pulled pork dressed simply with pickled onions, and a layer of Mexican rice. Being a half-Chinese guy from small town Nova Scotia, I’m not one to call out a taco for authenticity, but I do feel like rice is best left for burritos – I don’t need rice to fill out the taco to feel like I’m getting my money’s worth. The pork was moist and flavourful (from what I could tell amidst the lingering burning) and the pickled onions added a nice tanginess. They weren’t nearly as spicy as the chicken, so I assumed that it was the salsa verde that brought the pain. We snuck the pastor tacos into the movie because my other half threw in the towel after all that spice, and I ran out of time to eat them all on the way. They got a bit tossed around but were still really good. The grilled pineapple was a great addition against the rich pork, and the cilantro wasn’t layered on too heavily, just enough for that fresh pop. On my second visit this year, the truck was further south on Bank (before being unceremoniously towed by a city that prefers anti-competitive behaviour over fostering a healthy business environment). I was flying solo this time, and went with three tacos: two cochinita and one barbacoa. The pork and tortillas were as good as before, and I enjoyed the moist shredded beef. Yakko was the lone canine making an appearance, and soaked up the love from the line of customers. Yakko Taco is flying way too far under the digital radar for the quality of tacos that they’re putting out, as this is destination-worthy food. Go get some tacos at their new location, play with the dog(s), and burn your face off a little.